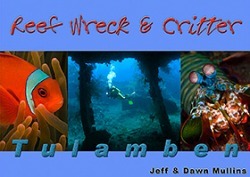 "Reef Wreck & Critter doesn't convey the sentiments of a fledgling high-school crush; their love of Tulamben is enduring and it shines through in each page of this fabulous visual guide". "It is very well illustrated and contains short sections of informative text and captions which will prove the perfect companion for those visiting this profuse area". "Having recently returned from a trip to north-east Bali, I was quite interested to review the book Tulamben - Reef, Wreck and Critter. Had I covered the best sites? What had I missed out on? I was pleased to find that I had dived the top half of the sites covered by the book and that the descriptions pretty much matched my impressions of the dives and the critters to look out for....I could have done with this guide book a couple of months earlier". I would recommend this book to anyone intending to visit Bali on a diving trip or to anyone who takes pleasure from well executed underwater photography. I would strongly recommend it to any of the seemingly endless numbers of divers who now own a housed compact digital camera. The latter on the basis of inspiration and encouragement; all of the photographs taken in this book were taken using Olympus compacts! Collated, photographed and published by Jeff & Dawn Mullins. This book is a visual tour of the many and varied dive sites of Tulamben, Bali's number - one dive destination. Located on the remote northeast coast of Bali, far from the crowds of the resorts on Bali's south coast, the area offers peace and tranquillity in a rural fishing village environment. Divers flock to Tulamben to dive the wreck of the Liberty, an American WWII shipwreck that rests just 40 metres from the shore. The wreck and surrounding reefs have been described by scientists as some of the richest marine environments in the World. Tulamben is also highly acclaimed by underwater photographers as a destination with easily accessible coral reefs and high concentrations of normally rare creatures. Clear, warm, calm water with mild currents gives divers the opportunity to dive all year-round. With 32 pages of images and information on Tulamben's underwater treasures. From the popular Liberty Wreck to newly discovered critter haunts like Seraya Secrets, this book reveals all. and have come to know each of the areas dive sites intimately.